Every business card you give out needs to instantly give an impression and distinguish you from the competition. Standard business cards are proven and tested to convey professionalism while sticking to the classic look. Our premium cardstock options and protective coatings will definitely give your standard business cards the stand out look it deserves. Our US standard business card sizes come in rectangle, slim, and square. Rounded corners give any size and shape a smooth, memorable edge. Each corner has a ¼” radius that makes the cards easy to pick up and distinguish from a pile of standard business cards. Which Paper Stock Should I Choose? 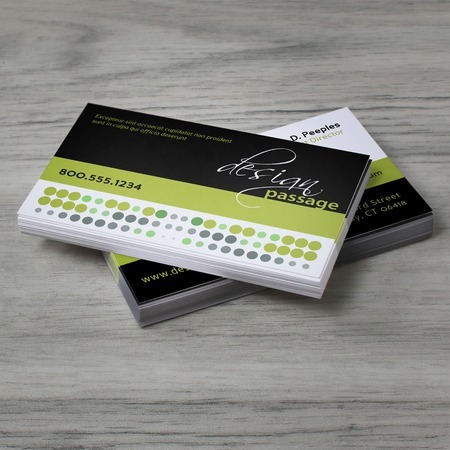 We offer three thick, substantial cardstock options that elevate the look and feel of simple business cards. Check out our comprehensive guide on how to choose the best business cardstock for more information. What Are the Best Business Card Design Practices? Several guidelines need to be followed as you create your own custom business cards. You can hire a professional designer to make sure all the basic rules are covered. However, an ambitious entrepreneur shouldn’t be afraid to think out of the box. Here are a few rules you can follow as you think about what to put on a business card. Short, sweet, and simple. A card provides limited space to make a good and lasting impression. Only show the most important contact information and make the text readable. Your logo should stand out but not take up all the space. Keep your clients in mind. While a standard business card is easy to give out and receive, the design itself should showcase what you can do. Create a look that appeals to your customers. Take calculated risks. Whether you’re an industry veteran or a start up success, your company can’t risk fading into the background. Add an extra feature such as an embossed text or pick your own custom shape. Print standard business cards today and choose a print turnaround time in as fast as 1 business day. Upload a ready-made design or download one of your layout templates to get started. You can check on the file before printing by selecting our free proof option. However you decide to tailor your design, our options guarantee high-quality business cards. When can I receive my business cards order? To find out when your business cards will arrive, input your ZIP code after selecting “Estimate Shipping Cost and Delivery Date” on our online calculator. What print guidelines should I keep in mind to ensure the file is print ready? Safety Line is placed around the actual business card design, particularly your logo, contact information, etc. Trim Area is the area between the bleed line and safety line. This provides additional room for cutting the business card. Bleed Line refers to the edge of your business card file. The background of your design should go all the way up to this area to prevent the appearance of a white border. What is the advantage of adding bundling or shrink wrapping to my order? Shrink wrapping seals your bulk order in a clear plastic film. It protects the business cards during shipping and storage, while also organizing your items in specific quantities.